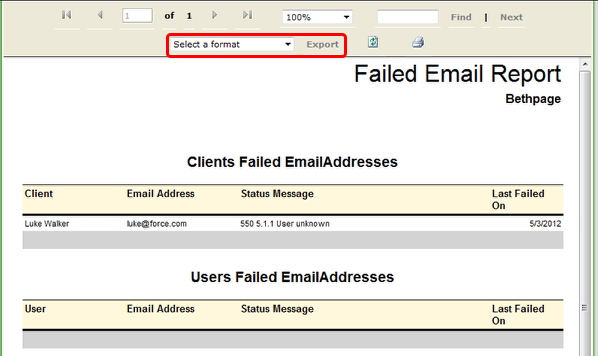 Generate a report showing client emails that failed when one or more attempts have been made to send an email to them. The date range is based on the last failed attempt to send an email to that email address. Note: If a customer states that they have not received an email and they are not on this list, please tell the customer to check their spam/junk mail folders. Note: Use the Navigation Sidebar to quickly navigate to other Reports without having to return to the main Reports page. 1. Select the Start Date. 2. Select the End Date. 3. Click on Generate Report. Note: You can export this report by selecting a format and clicking export.